As the main A803 from Linlithgow approaches the east side of the centre of Falkirk, drivers not too busy looking out for roadsigns can, to their left, catch the briefest glimpse through a gap in an embankment of what for all the world looks like a large French château. This is Callendar House, and the "embankment" it is hiding behind is part of the Antonine Wall, built here by the Romans 2,000 years ago. 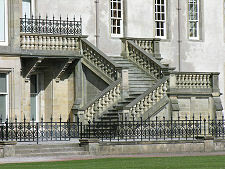 Today's Callendar House is the focal point of the extensive Callendar Park, once the landscaped gardens for the house. 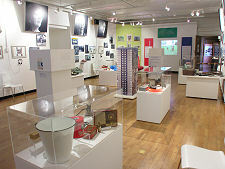 The house itself is open all year round to visitors and serves as a surprisingly extensive and well-stocked museum; a venue for conferences and weddings; a home for Falkirk Council's archive service, and a giftshop. Meanwhile, the old stables by the main car park now house the Callendar House Teashop and the Park Gallery, a contemporary visual art and craft space. 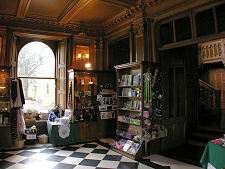 As it serves such a wide variety of functions, what you find at Callendar House depends very much on why you are there. The main entrance to the house is located in the centre of its north face, through the obviously projecting entrance lobby. 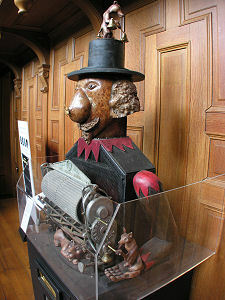 Today this houses the reception desk and the gift shop. 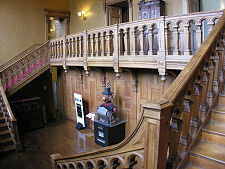 Beyond the lobby you move through to the heart of the house, the beautifully wood-panelled stair hall. The character of the grand stately home that Callendar House once was can best be seen on the first floor. Here, to the rear of the corridor running across the stair hall at this level, are the two main state rooms, the drawing room and the morning room. 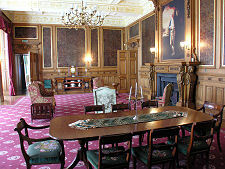 The drawing room comes in subtle shades of green, while the morning room is a much more imposing mixture of red carpeting and inlaid wood panelling. Both rooms look out onto the gardens on the south side of the house. 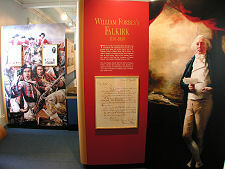 To the west of the stair hall is the home of Falkirk Council's archive service, forming what is now called the History Research Centre in the library of Callendar House. It would be difficult to imagine many better places for an archivist to work than in this amazing room. 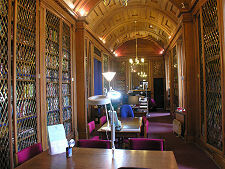 The walls are lined with bookcases fronted by latticed bronze screens: all under a barrel-vaulted wooden ceiling. 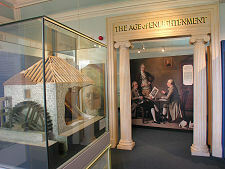 Parts of three floors of Callendar House are given over to its role as a museum. On the ground floor you can find out about the past of the house itself, the Lords and Ladies who lived here, and aspects of life in Falkirk in the early centuries of its life. Here, too, you find the main temporary exhibition area, in which new exhibitions are opened every few months. But no tour of the ground floor is complete without making your way to the enormous and extremely impressive 1825 kitchen, said to be the largest in Scotland. Here you will often find interpreters whose role is to help bring the kitchen to life around you. 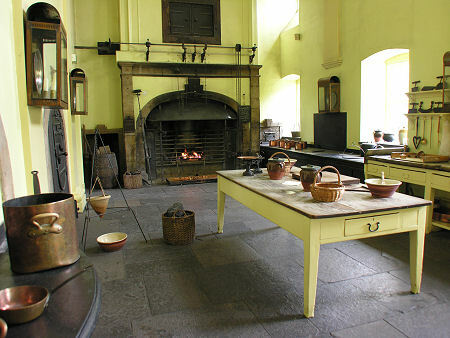 Ask nicely and you might get to sample food made as it would have been in the early 1800s: and while you do, listen to stories about the lives of those whose hard work made possible the life of ease enjoyed by the "upstairs" residents of Callendar House. 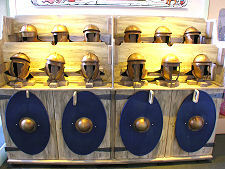 On the first floor the exhibitions focus on the Romans and those here on educational visits will find stocks of Roman clothing, complete with helmets and shields. 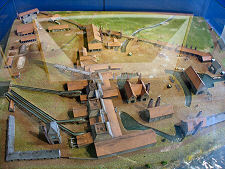 The main exhibition areas are on the second floor and here a wide range of subjects are covered with effective use of information boards, exhibits and a highly impressive collection of landscape models, ranging from the 1745 Battle of Falkirk via the Carron Iron Works to the early growth of Falkirk and a large Roman fort. 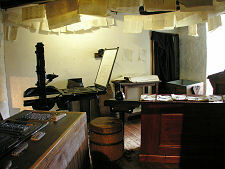 There are also a series of re-created early 1800s shops. 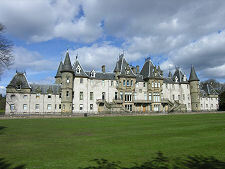 For many visitors, Callendar House itself is a large part of the attraction of coming here. On first appearance it does seem strikingly French in appearance and design, and that is an impression that only becomes stronger as you see more of it. It is almost as if a chunk of the Loire Valley had been scooped up, château and all, and deposited in central Scotland. The reality is very much more complex. From the mid-1100s, the Thanes of Callendar occupied a residence near the site of today's Callendar House. In 1345 the estate was granted by David II to Sir William Livingston, and by about 1400s the Livingstons had built a tower house here. Today this forms part of the north west corner of the main block of Callendar House, but evidence of it is all but covered over by the repeated rebuilding and redevelopment that has taken place since. The Livingstons continued to stay close to the centre of power in Scotland for nearly four centuries, and the growth of Callendar House reflected the growth of the family's prestige and wealth. 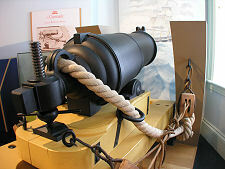 Things looked to be taking a turn for the worse when James, 8th Lord Livingston, backed the royalist cause in the civil wars of the 1640s, and in 1651 Callendar House was besieged by Cromwell's troops under the command of General Monck. The family regained the house after the restoration of Charles II in 1660. The end came when James Livingston, 4th Earl of Callendar and 5th Earl of Linlithgow, backed the losing Jacobite cause in the 1715 uprising. 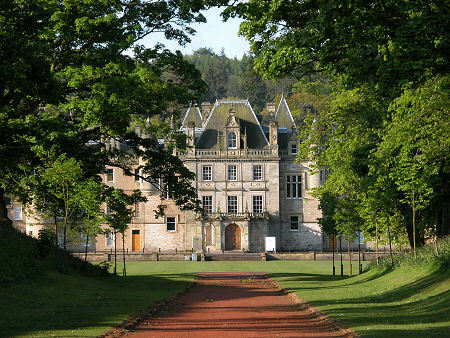 His estates were forfeited to the crown and, in 1783, Callendar House and the surrounding estates were sold to William Forbes, a wealthy London coppersmith. The Forbes family were to continue to own Callendar House until 1963, and it was they who, in 1843, oversaw the last of the major redevelopments of the house, turning it into the French fantasy you see today. In 1963 the house and estate were compulsorily purchased by Falkirk Town Council to provide land close to the town centre where they could build a number of blocks of high rise flats to tackle housing shortages. But their plans did not extend to Callendar House itself, which spent the next two decades boarded up and seemingly heading for dereliction and ruin. 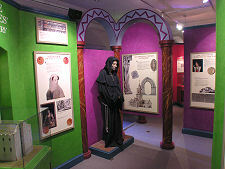 In the 1980s it became home to the Council's museum service, and since 1997 it has performed its current range of functions, primarily as a museum. Callendar Park, Falkirk, FK1 1YR.